I’m really enjoying the Legion of Angels series. It’s been a while since I’ve found a series where I’ve wanted to read one book after another. 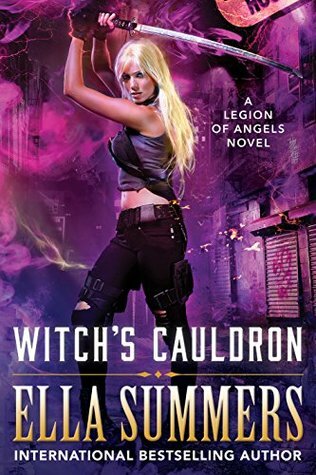 Witch’s Cauldron takes us back into the Legion world and continues on from Vampire’s Kiss. Here the Legion is investigating demons and the witches. Their seams to be attacks happening all over agenst the supernaturals. Leda has grown stronger and is an asset to the Legion. Nix, the First Angel sees this and orders Nero to move Leda up to the second level and she wants her in on the investigation. She use to be a bounty hunter, so she has experience in investigating. She can work well in many different tasks and still find time for training. I really like Leda. She’s strong-willed, stubborn, and determined to make it to the level that will give her the power to find her missing brother. She tries hard to be the best Legion officer, but she has a hard time controlling her mouth. She’s also got some strong feelings for Nero that keep getting in the way. I find the different levels or steps that the Legion members have to go through to gain the next gift from the gods, interesting. This puts a unique spin on the world. Their is no guarantee that everyone will survive and it feels like you loose a little of your humanity the farther up you get. Leda is showing everyone that you don’t have to lose yourself when you gain powers. She’s sorta changing the status quo in little ways. We no longer have a triangle romance. Leda’s attraction is now focused on one man, Nero the Leader of the New Your office of the Legion and also her personal trainer or should I say slave driver. The attraction is intense and Leda does a good job trying to separate the attraction from her work and training. I’m not sure if they will come together. Nero is intense, closed off, and disengaged from humanity. I’m hoping she can show him that there is more. I enjoy their sparing (bickering) matches. Their’s more world building and lots of action. It’s all exciting and exhilarating. I couldn’t stop reading. The relationship parts where stressful; because these two just can’t seam to find the right fight. Maybe down the road. I was happy to see that Leda got to see her sister, Bella, while working the investigating. As for the investigation, well the villains where a surprise and what happens along the way, had me holding my breath and hoping they would all survive. Witch’s Cauldron is a lot of fun, exciting, and entertaining. I devoured the book and had to start book #3, Siren’s Song, right away. Urban Fantasy fans will enjoy this series. I have never heard of this series but it sounds interesting! Great review! I am dying waiting for Shifters Shadows and now book 6 to come out in audio. I really want to listen to them, but Tantor claimed they still don’t have the rights to them. I’ve tweeted the author. I just have to continue this series! Glad you enjoyed the review. Thank you for sharing! I love the narrator for this series, Cris Dukeheart. I’m going to have to check this out. That’s great you love the narrator. I hope you enjoy the series. I had a lot of fun and am looking forward to more books.